21 Oct. R. O. St. P., IX. 522. 291. Wallop to Henry VIII. On the 19th the Emperor arrived before Landercy, and at once willed the Great Master to conduct him to the English camp. Wallop and the Council met him and brought him along the upper part of it, where he saw the soldiers in array, 81 in a rank, and admired the fortification by means of a trench a pike and a half length from the carts; a device which Wallop said was first used against him, being that of the French king's camp at Vienne when he came into Provence. He thought the officers "ungne belle bende de gentilz hommes," and himself much bound to Henry for sending so goodly a company. He then went to his lodging to dinner, telling by the way how sick he had been since leaving Venelot and how his harness was now too large for him. After dining he leapt on horseback and departed towards Avannes, Wallop being one of his conductors. At Marole, an Italian from Fernando de Goonzago's camp reported that a great company of French horsemen had been seen. The Emperor thereupon demanded avant couriers "to discover the country," and Wallop offered 200 light horse who, he said, would do as well as any Albanoys, Alarbes or any other nation; and when the Emperor "saw them hoorle up the hill so lightly, he said, Par ma foy, voyla de gens qui vont de grand courraige, et ilz semblent tresbien les Alarbes d' Affrice." Afterwards, when he sent out 20 of his own men, they went so heavily that Wallop thought the bridge of Marolle would have sunk under them. Describes some other incidents of the day. The Emperor's army will lie before Landercy until it be gotten unless the French king give battle. Fernando de Goonzago's army lies two miles from this beyond the water; but he has sent his battery pieces to this side to batter the lower end of the town and be safe from capture if the French king come in force. The duke of Arshcote's ordnance has made good battery to the old castle adjoining the gate already taken, "being seventeen of the fairest cannons that I have seen." Thinks Fernando's shall begin to-morrow. If the Duke and Great Master had not persuaded the Emperor, we had been gone ere now, for Fernando and his men like not the foul weather of this country. Our men do not complain; yet, in these four or five days many are fallen sick. With the Emperor came Mons. de Bures and 6,000 Fryses. The French king is at La Faire and Mons. d' Orleans sick of the small pox. The Dauphin is at St. Quentin, where they assemble men of war. Doubting the French king's coming to Cambray, the Emperor has sent thither 600 horse and 6 ensigns of foot. From the camp, 21 Oct. Signed. Pp. 5. Add. Endd. : 1543. R. O. St. P., IX. 526. R. O. 292. Charles V. to Henry VIII. 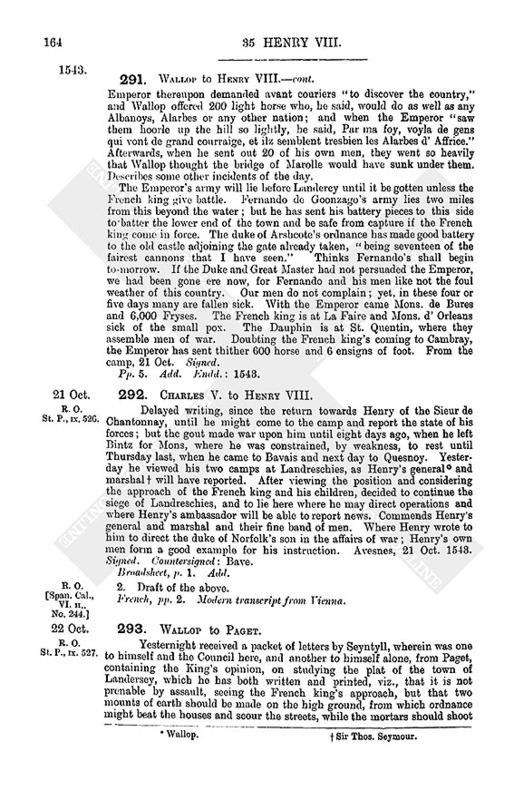 Delayed writing, since the return towards Henry of the Sieur de Chantonnay, until he might come to the camp and report the state of his forces; but the gout made war upon him until eight days ago, when he left Bintz for Mons, where he was constrained, by weakness, to rest until Thursday last, when he came to Bavais and next day to Quesnoy. Yesterday he viewed his two camps at Landreschies, as Henry's general (fn. 1) and marshal (fn. 2) will have reported. After viewing the position and considering the approach of the French king and his children, decided to continue the siege of Landreschies, and to lie here where he may direct operations and where Henry's ambassador will be able to report news. Commends Henry's general and marshal and their fine band of men. Where Henry wrote to him to direct the duke of Norfolk's son in the affairs of war; Henry's own men form a good example for his instruction. Avesnes, 21 Oct. 1543. Signed. Countersigned : Bave. 2. Draft of the above. R. O. St. P., IX. 527. Yesternight received a packet of letters by Seyntyll, wherein was one to himself and the Council here, and another to himself alone, from Paget, containing the King's opinion, on studying the plat of the town of Landersey, which he has both written and printed, viz., that it is not prenable by assault, seeing the French king's approach, but that two mounts of earth should be made on the high ground, from which ordnance might beat the houses and scour the streets, while the mortars should shoot from the camp, day and night, "such shot as would break of itself and scatter abroad to do hurt." 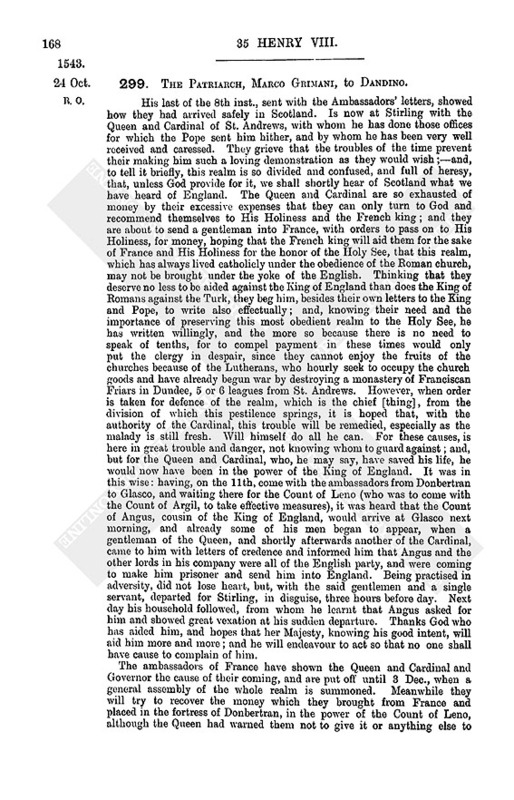 The King's desire that this opinion should be shown to Mons. de Riues or other the Emperor's lieutenant is done; for De Rieux came at 7 a.m. for Wallop's advice about the new camp and the Duke (fn. 3) at 8 p.m. to relate what Fernando de Goonzago and he had done to close the gate at the far side of the town, and both of them liked Henry's opinion marvellously and already minded the same, save the making of the mounts, about which they would consult Fernando. They will give no assault, but continue to mine, certain Almains having taken upon them to undermine the bulwark that corresponds to the castle. They have 5 or 6 mortars "and much wild fire in arrows to shoot into the town." Describes a great mortar and the shot, some of them "artificial, full of wildfire and a forty or fifty shot of guns within them, every one of them able to kill a man." These have been heard to shoot after they fell in the town, and each of them costs 30 guyldons. Six more mortars come from Monkes to-morrow. With all these and 40 cannons beating continually, the town cannot endure 12 days, and, indeed, it has written to the French king that unless revictualled in 14 days it must give over; which time will agree for our departure if the Emperor do not retain us at his own charges. Having declared the receipt of the King's letters, did not mention how near the time draws lest it should be thought to be done by command, but will do so within two days. As to the postscript of Paget's letters concerning Jehan Bernardyn, I have written to my lord Privy Seal and Sir Ant. Browne declaring my knowledge and yours of his good services, "and that my lord of London could te[ll of his service] in tim[es past] better than any of us both who wroug[ht and] wrote most by his counsel." Commendations to Mr. Wriothesley, being sorry for his disease but trusting that the good air of Hampshire will shortly make him whole. Camp before Landercy, 22 Oct. Signed. P.S.Trusts he has received a packet directed to Mr. Wriothesley and him, with a particular letter to the King, and a great packet and particular letter to my lord of Winchester, dated this day and sent to Tychet at Calais. Pp. 3. Slightly mutilated. Add. Endd. : 1543. 294. Charles V. to Chapuys. Encloses copy of his letter to the King of England at the request of the general of the English, Mr. Walop, who verily does his duty well. The marshal (fn. 4) has often shown himself more dry and difficult. Sends also copy of the letter he wrote, on Saturday, at his return from the camp, to the Queen, in order that (knowing the resolution taken with Don Fernande, Arschot and De Reulx, after communicating with the said English) Chapuys may speak to the King as it were in confidence. Since returning hither, learns that the Daulphin is at St. Quantin, and the Swiss, Almains, Italians and French lodged thereabouts, intending to do all they can to succour Landreschies. 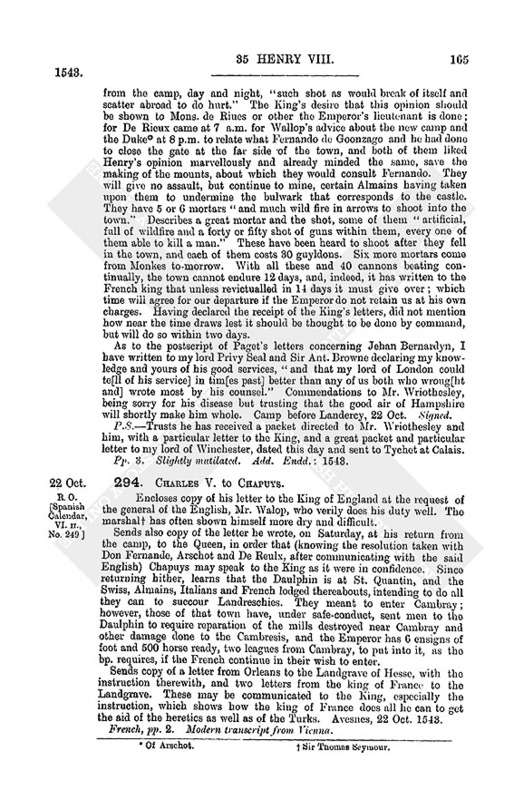 They meant to enter Cambray; however, those of that town have, under safe-conduct, sent men to the Daulphin to require reparation of the mills destroyed near Cambray and other damage done to the Cambresis, and the Emperor has 6 ensigns of foot and 500 horse ready, two leagues from Cambray, to put into it, as the bp. requires, if the French continue in their wish to enter. Sends copy of a letter from Orleans to the Landgrave of Hesse, with the instruction therewith, and two letters from the king of France to the Landgrave. These may be communicated to the King, especially the instruction, which shows how the king of France does all he can to get the aid of the heretics as well as of the Turks. Avesnes, 22 Oct. 1543. Add. MS. 32,652, f. 234 B. M. Hamilton Papers, II., No. 70. 295. Nicholas Throkemorton to Parr. In his conference on the 22nd inst. with Walter Carr of Cesforthe, Sir Walter Scott of Bowclowghe and Mark Carr, at Carram, found much less conformity than he expected. 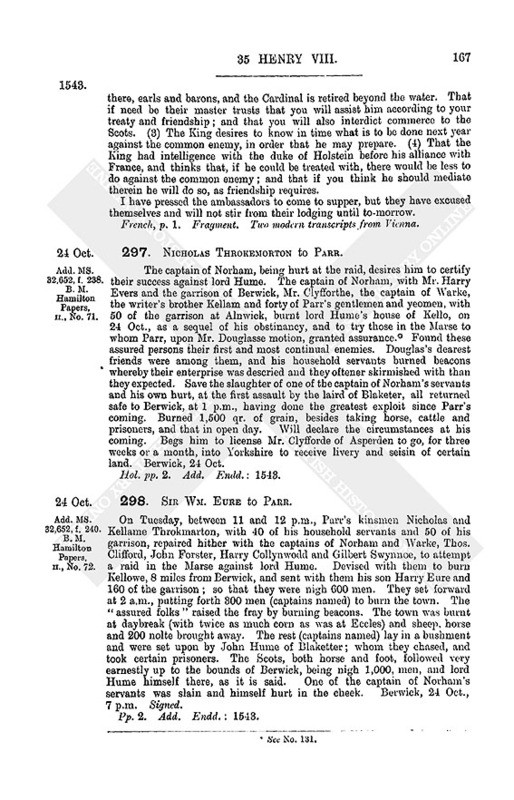 When they began by declaring that they would procure any means to have the King surcease the rigour of the sword against them, he supposed that they would proffer something, or else condescend to what he (by Parr's command) should propone; but the effect of their long prattling was that they did not impugn the treaties and would induce the chosen Council of Scotland (with whom they boasted that they did much prevail) to perform them, if Parr would meanwhile make abstinence on the Borders. Answered that the treaties concluded by their ambassadors were (notwithstanding sundry ratifications) not accomplished in time, and Parr, not knowing whether the King would accept them again, would intromit with no private person touching such a matter; but, if they, with humble submission to the King, relinquishing the perverse factions which they adhered to, would become the King's servants and combine with his friends, Parr would desist from annoying them, and would so prefer them to the King that they should be able to resist the malice of the greatest in Scotland. "The larde of Bowclowghe very furiously answered that they would rather be hanged than so disgrade their houses," swearing that they would be true Scottish men and marvelling that Parr "would so will them to stain their honors." Told them how they were forfeiting Parr's pity and procuring their own destruction, and that the assurance granted at their suit would hereupon cease. They, with idle suggestions, extolling the Cardinal and his adherents, protracted the time till night; when the writer departed towards Norham, devising, by the way, with the captain of Warke to show them some fruits of their obstinacy at Kelso where they all lodged; who, having no convenient number to encounter the Scots assembled with those chieftains, approached in the dark within half a mile of Kelso, with 60 men, and burnt a grange and took prisoner Dan Carre's horsekeeper. The above declares all proceedings on the 22nd Oct., save that the laird of Sessforthe claimed the benefit of Parr's assurance, (fn. 5) within which time Robert of Colyngwoode attempted a raid at Hounam and exploited certain cattle. Thinks restitution should be made "that no proud neither perverse Scot, being your enemy, may have cause to exclaim against your promise." Told him that Parr would see to it, if he would send a certificate of the goods taken and make like redress if any Englishman during the said five days was plaintiff; whereunto he condescended. 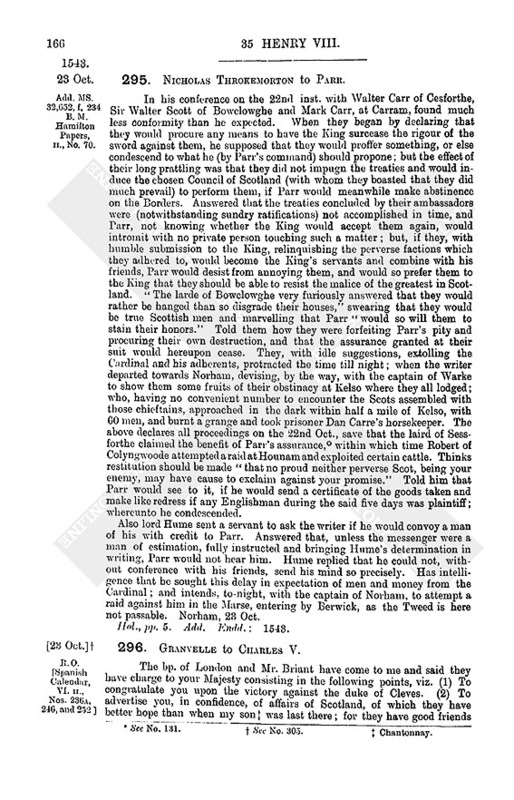 Also lord Hume sent a servant to ask the writer if he would convoy a man of his with credit to Parr. Answered that, unless the messenger were a man of estimation, fully instructed and bringing Hume's determination in writing, Parr would not hear him. Hume replied that he could not, without conference with his friends, send his mind so precisely. Has intelligence that he sought this delay in expectation of men and money from the Cardinal; and intends, to-night, with the captain of Norham, to attempt a raid against him in the Marse, entering by Berwick, as the Tweed is here not passable. Norham, 23 Oct. Hol., pp. 5. Add. Endd. : 1543. 296. Granvelle to Charles V.
The bp. of London and Mr. Briant have come to me and said they have charge to your Majesty consisting in the following points, viz. (1) To congratulate you upon the victory against the duke of Cleves. (2) To advertise you, in confidence, of affairs of Scotland, of which they have better hope than when my son (fn. 7) was last there; for they have good friends there, earls and barons, and the Cardinal is retired beyond the water. That if need be their master trusts that you will assist him according to your treaty and friendship; and that you will also interdict commerce to the Scots. (3) The King desires to know in time what is to be done next year against the common enemy, in order that he may prepare. (4) That the King had intelligence with the duke of Holstein before his alliance with France, and thinks that, if he could be treated with, there would be less to do against the common enemy; and that if you think he should mediate therein he will do so, as friendship requires. I have pressed the ambassadors to come to supper, but they have excused themselves and will not stir from their lodging until to-morrow. French, p. 1. Fragment. Two modern transcripts from Vienna. Add. MS. 32,652, f. 238. B. M. Hamilton Papers, II., No. 71. 297. Nicholas Throkemorton to Parr. The captain of Norham, being hurt at the raid, desires him to certify their success against lord Hume. The captain of Norham, with Mr. Harry Evers and the garrison of Berwick, Mr. Clyfforthe, the captain of Warke, the writer's brother Kellam and forty of Parr's gentlemen and yeomen, with 50 of the garrison at Alnwick, burnt lord Hume's house of Kello, on 24 Oct., as a sequel of his obstinancy, and to try those in the Marse to whom Parr, upon Mr. Douglasse motion, granted assurance. (fn. 8) Found these assured persons their first and most continual enemies. Douglas's dearest friends were among them, and his household servants burned beacons whereby their enterprise was descried and they oftener skirmished with than they expected. Save the slaughter of one of the captain of Norham's servants and his own hurt, at the first assault by the laird of Blaketer, all returned safe to Berwick, at 1 p.m., having done the greatest exploit since Parr's coming. Burned 1,500 qr. of grain, besides taking horse, cattle and prisoners, and that in open day. Will declare the circumstances at his coming. Begs him to license Mr. Clyfforde of Asperden to go, for three weeks or a month, into Yorkshire to receive livery and seisin of certain land. Berwick, 24 Oct.
Hol. pp. 2. Add. Endd. : 1543. Add. MS. 32,652, f. 240. B. M. Hamilton Papers, II., No. 72. 298. Sir Wm. Eure to Parr. On Tuesday, between 11 and 12 p.m., Parr's kinsmen Nicholas and Kellame Throkmarton, with 40 of his household servants and 50 of his garrison, repaired hither with the captains of Norham and Warke, Thos. Clifford, John Forster, Harry Collynwodd and Gilbert Swynnoe, to attempt a raid in the Marse against lord Hume. Devised with them to burn Kellowe, 8 miles from Berwick, and sent with them his son Harry Eure and 160 of the garrison; so that they were nigh 600 men. They set forward at 2 a.m., putting forth 300 men (captains named) to burn the town. The "assured folks" raised the fray by burning beacons. The town was burnt at daybreak (with twice as much corn as was at Eccles) and sheep, horse and 200 nolte brought away. The rest (captains named) lay in a bushment and were set upon by John Hume of Blaketter; whom they chased, and took certain prisoners. The Scots, both horse and foot, followed very earnestly up to the bounds of Berwick, being nigh 1,000, men, and lord Hume himself there, as it is said. One of the captain of Norham's servants was slain and himself hurt in the cheek. Berwick, 24 Oct., 7 p.m. Signed. Pp. 2. Add. Endd. : 1543. 299. The Patriarch, Marco Grimani, to Dandino. His last of the 8th inst., sent with the Ambassadors' letters, showed how they had arrived safely in Scotland. Is now at Stirling with the Queen and Cardinal of St. Andrews, with whom he has done those offices for which the Pope sent him hither, and by whom he has been very well received and caressed. They grieve that the troubles of the time prevent their making him such a loving demonstration as they would wish;and, to tell it briefly, this realm is so divided and confused, and full of heresy, that, unless God provide for it, we shall shortly hear of Scotland what we have heard of England. The Queen and Cardinal are so exhausted of money by their excessive expenses that they can only turn to God and recommend themselves to His Holiness and the French king; and they are about to send a gentleman into France, with orders to pass on to His Holiness, for money, hoping that the French king will aid them for the sake of France and His Holiness for the honor of the Holy See, that this realm, which has always lived catholicly under the obedience of the Roman church, may not be brought under the yoke of the English. Thinking that they deserve no less to be aided against the King of England than does the King of Romans against the Turk, they beg him, besides their own letters to the King and Pope, to write also effectually; and, knowing their need and the importance of preserving this most obedient realm to the Holy See, he has written willingly, and the more so because there is no need to speak of tenths, for to compel payment in these times would only put the clergy in despair, since they cannot enjoy the fruits of the churches because of the Lutherans, who hourly seek to occupy the church goods and have already begun war by destroying a monastery of Franciscan Friars in Dundee, 5 or 6 leagues from St. Andrews. However, when order is taken for defence of the realm, which is the chief [thing], from the division of which this pestilence springs, it is hoped that, with the authority of the Cardinal, this trouble will be remedied, especially as the malady is still fresh. Will himself do all he can. For these causes, is here in great trouble and danger, not knowing whom to guard against; and, but for the Queen and Cardinal, who, he may say, have saved his life, he would now have been in the power of the King of England. It was in this wise : having, on the 11th, come with the ambassadors from Donbertran to Glasco, and waiting there for the Count of Leno (who was to come with the Count of Argil, to take effective measures), it was heard that the Count of Angus, cousin of the King of England, would arrive at Glasco next morning, and already some of his men began to appear, when a gentleman of the Queen, and shortly afterwards another of the Cardinal, came to him with letters of credence and informed him that Angus and the other lords in his company were all of the English party, and were coming to make him prisoner and send him into England. Being practised in adversity, did not lose heart, but, with the said gentlemen and a single servant, departed for Stirling, in disguise, three hours before day. Next day his household followed, from whom he learnt that Angus asked for him and showed great vexation at his sudden departure. Thanks God who has aided him, and hopes that her Majesty, knowing his good intent, will aid him more and more; and he will endeavour to act so that no one shall have cause to complain of him. 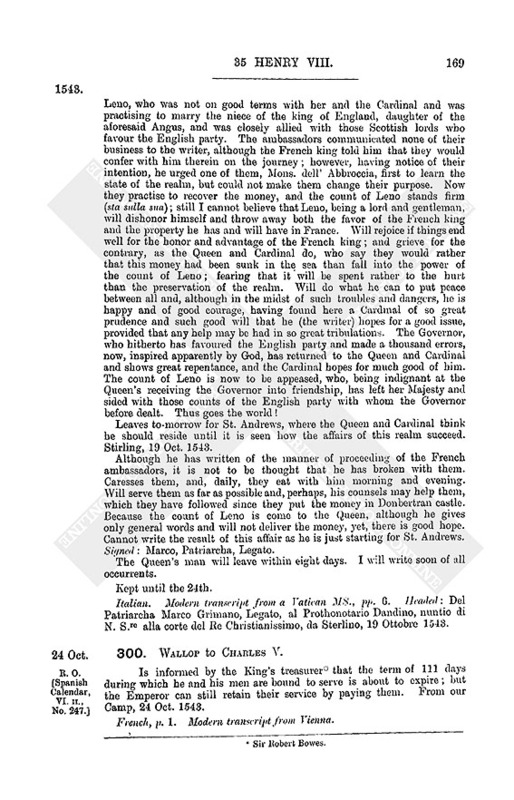 The ambassadors of France have shown the Queen and Cardinal and Governor the cause of their coming, and are put off until 3 Dec., when a general assembly of the whole realm is summoned. Meanwhile they will try to recover the money which they brought from France and placed in the fortress of Donbertran, in the power of the Count of Leno, although the Queen had warned them not to give it or anything else to Leno, who was not on good terms with her and the Cardinal and was practising to marry the niece of the king of England, daughter of the aforesaid Angus, and was closely allied with those Scottish lords who favour the English party. The ambassadors communicated none of their business to the writer, although the French king told him that they would confer with him therein on the journey; however, having notice of their intention, he urged one of them, Mons. dell' Abbroccia, first to learn the state of the realm, but could not make them change their purpose. Now they practise to recover the money, and the count of Leno stands firm (sta sulla sua); still I cannot believe that Leno, being a lord and gentleman, will dishonor himself and throw away both the favor of the French king and the property he has and will have in France. Will rejoice if things end well for the honor and advantage of the French king; and grieve for the contrary, as the Queen and Cardinal do, who say they would rather that this money had been sunk in the sea than fall into the power of the count of Leno; fearing that it will be spent rather to the hurt than the preservation of the realm. Will do what he can to put peace between all and, although in the midst of such troubles and dangers, he is happy and of good courage, having found here a Cardinal of so great prudence and such good will that he (the writer) hopes for a good issue, provided that any help may be had in so great tribulations. The Governor, who hitherto has favoured the English party and made a thousand errors, now, inspired apparently by God, has returned to the Queen and Cardinal and shows great repentance, and the Cardinal hopes for much good of him. The count of Leno is now to be appeased, who, being indignant at the Queen's receiving the Governor into friendship, has left her Majesty and sided with those counts of the English party with whom the Governor before dealt. Thus goes the world! Leaves to-morrow for St. Andrews, where the Queen and Cardinal think he should reside until it is seen how the affairs of this realm succeed. Stirling, 19 Oct. 1543. Although he has written of the manner of proceeding of the French ambassadors, it is not to be thought that he has broken with them. Caresses them, and, daily, they eat with him morning and evening. Will serve them as far as possible and, perhaps, his counsels may help them, which they have followed since they put the money in Donbertran castle. Because the count of Leno is come to the Queen, although he gives only general words and will not deliver the money, yet, there is good hope. Cannot write the result of this affair as he is just starting for St. Andrews. Signed : Marco, Patriarcha, Legato. The Queen's man will leave within eight days. I will write soon of all occurrents. Italian. Modern transcript from a Vatican MS., pp. 6. Headed : Del Patriarcha Marco Grimano, Legato, al Prothonotario Dandino, nuntio di N. S.re alla corte del Re Christianissimo, da Sterlino, 19 Ottobre 1543. 300. Wallop to Charles V.
Is informed by the King's treasurer (fn. 9) that the term of 111 days during which he and his men are bound to serve is about to expire; but the Emperor can still retain their service by paying them. From our Camp, 24 Oct. 1543. Venetian Calendar (Brown) V. 120. Motion passed, 24 Oct. 1543, in the Venetian Council to license Mr. Wm. Cobham and Dom. John Schier, with two servants each, to wear weapons within the Signory's rule, for two years. Add. MS. 32,652, f. 242. B. M. Hamilton Papers, II., No. 73. Sadler State Papers, I. 320. 302. Sadler to the Council. Perceives, by theirs of the 19th, that the King marvels at his hazarding to abide here after Angus and the other lords departed westwards; and that he is to repair to Angus. Prayed the said lords that he might either go with them westwards or have the loan of Angus's house of Temptallon to lie in; but they thought it nowise convenient for him to go with them, and rather than that, Angus was content to lend Temptallon, but required five or six days to furnish it, although Sadler pressed to go at once. As there was muttering that he should not depart till the ships were restored, and they had no company to convey him away by force, they prayed him to keep this secret; but what secrecy they used he cannot tell, for, next day, the Provost and many of the town came to say they understood that he feared to tarry behind the lords, and to assure him that it should cost 1,000 men's lives ere he and his should suffer displeasure. Thanked them, and showed that it was not for fear but for recreation that he desired to be away. Angus promised that his brother George should come within 4 or 5 days to convey him to Temptallon; but he has heard nothing since. A servant reports that there is neither bedding, household stuff nor victual there. And yet, had he not fallen sick, he would have made shift to be there ere this; and as soon as he can ride he will prepare thitherwards. Yesterday Maxwell, having been with the Governor at Lythcoo, for private causes, came hither; and Sadler asked to be conveyed to Angus and that party. 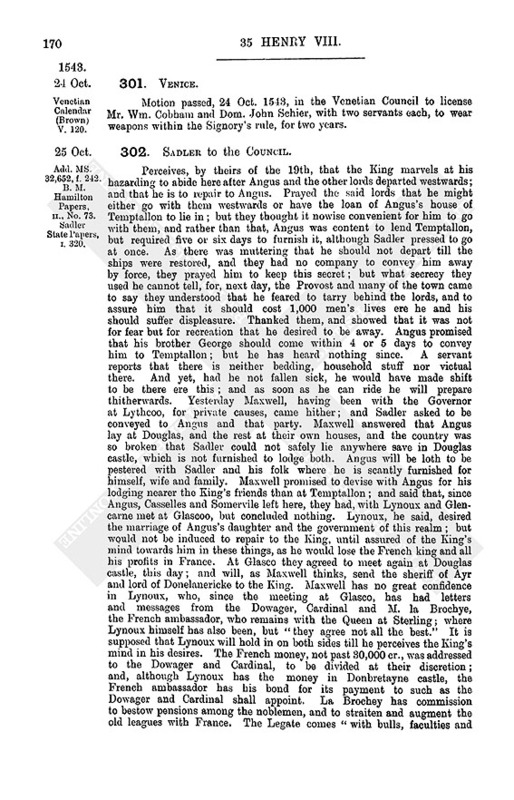 Maxwell answered that Angus lay at Douglas, and the rest at their own houses, and the country was so broken that Sadler could not safely lie anywhere save in Douglas castle, which is not furnished to lodge both. Angus will be loth to be pestered with Sadler and his folk where he is scantly furnished for himself, wife and family. Maxwell promised to devise with Angus for his lodging nearer the King's friends than at Temptallon; and said that, since Angus, Casselles and Somervile left here, they had, with Lynoux and Glencarne met at Glascoo, but concluded nothing. Lynoux, he said, desired the marriage of Angus's daughter and the government of this realm; but would not be induced to repair to the King, until assured of the King's mind towards him in these things, as he would lose the French king and all his profits in France. At Glasco they agreed to meet again at Douglas castle, this day; and will, as Maxwell thinks, send the sheriff of Ayr and lord of Donelanericke to the King. Maxwell has no great confidence in Lynoux, who, since the meeting at Glasco, has had letters and messages from the Dowager, Cardinal and M. la Brochye, the French ambassador, who remains with the Queen at Sterling; where Lynoux himself has also been, but "they agree not all the best." It is supposed that Lynoux will hold in on both sides till he perceives the King's mind in his desires. The French money, not past 30,000 cr., was addressed to the Dowager and Cardinal, to be divided at their discretion; and, although Lynoux has the money in Donbretayne castle, the French ambassador has his bond for its payment to such as the Dowager and Cardinal shall appoint. La Brochey has commission to bestow pensions among the noblemen, and to straiten and augment the old leagues with France. The Legate comes "with bulls, faculties and pardons to get money," and, finding the people so wild, wishes himself at home again. The Cardinal and he are gone to St. Andrews. The Governor lies at Lythcoo, and will be here within four or five days. The Provost and township have not made their promised answer to Sadler's condition for the restitution of their ships, of which he wrote on the 6th. Understands that they are offended with it, and say they will rather lose ships and goods, and their lives too, than become traitors to their country. Edinburgh, 25 Oct. Signed. In cipher, pp. 8. Add. Endd. : 1543. 2. Decipher of the preceding. John a Barton is not yet gone to the seas, but as soon as wind serves he will go with the Mary Willoughby and 9 sail more, well furnished and determined to accomplish the voyage to Bordeaux or die. Some say that John a Barton will not go unless he have the King's safe conduct, for which he and other merchants have "made some means" to Sadler. Surely, if the King appoint ships of war to lie on those coasts and prevent the Scots from sailing out, it will utterly beggar this town. 303. Sir Francis Bryan to Paget. Has delivered Francis the courier 20 nobles for his despatch to England and desires Paget to help him to money for his despatch hither. Avenys, 25 Oct. He will see the news that comes to the King. "Advertising you that Monsr. Degrandvell could advertise me of the arrival in Scotland of the Papyshe patriarke, as so here he is called, before I could make answer to the same. I write this to you because I have heard you say that th'ambassadors being in these parts and out of England could not have news from you and other of the King's Council so soon as the Ambassador doth send hither." Signed. P. 1. Add. : To my especial good friend Mr. Pachet, one of the King's Majesty's principal secretaries. Endd. : 1543. 304. Wallop to Henry VIII. According to instructions lately sent by the Council and by Mr. Paget, conferred with Arscott and the Great Master concerning the approaching end of the four months during which Henry has sustained the charge of his army here, viz. 12 July to 1 Nov. They desired that it might be signified to the Emperor, at Avenez. Wallop (advised by the Council here) thereupon wrote to the Emperor that the treasurer had notified that the 112 days for which this army was furnished to serve "against the violence of the French king" ended on 1 Nov., and, if the Emperor wished them to continue after that time, he should furnish their wages and entertainment, or, if not, license them to return home. 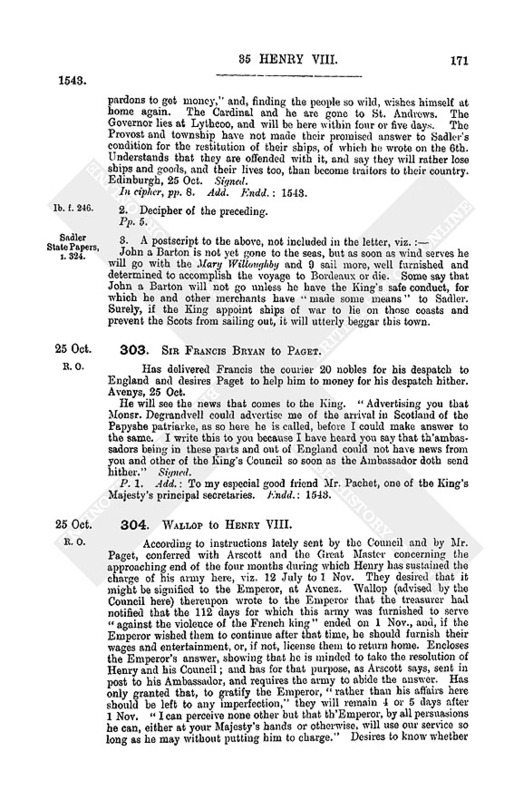 Encloses the Emperor's answer, showing that he is minded to take the resolution of Henry and his Council; and has for that purpose, as Arscott says, sent in post to his Ambassador, and requires the army to abide the answer. Has only granted that, to gratify the Emperor, "rather than his affairs here should be left to any imperfection," they will remain 4 or 5 days after 1 Nov. "I can perceive none other but that th'Emperor, by all persuasions he can, either at your Majesty's hands or otherwise, will use our service so long as he may without putting him to charge." Desires to know whether Henry will vary from the former advertisement sent by his Council, which, otherwise, Wallop will "ensue" after 9 Nov. The camp before Landresey, 25 Oct. Signed. 305. Charles V. to Chapuys. Received his letters of the 5th inst., the day before yesterday, by Mr. Briant, who arrived here with the bp. of London. Gave them audience yesterday, when, with the King's letters of credence for Briant, they declared their charge, viz. :1. To congratulate the Emperor on his success against the duke of Cleves, and his conquest of Gueldres and Zutphen. 2. To declare that their master's affairs with Scotland went better than when Chantonay was last in England, and perhaps they would agree; but if, through French practices and the coming of the Patriarch of Achelaya, it went otherwise, he trusted to have the Emperor's assistance according to the treaty and to friendship. 3. To say that the King desired to know early what should be done next year touching the common enterprise against the enemy. 4. To urge that the Emperor's ships might join the English, to hinder the French herring fishing. (And on this they insisted, saying that the Emperor had not as yet, in the army by sea, satisfied the treaty, and great damage could be done to the enemy.) 5. To say that their master heard that the duke of Holstein, who styles himself king of Denmark, would like to appoint with the Emperor, in view of the exploit done against Cleves; and their master thought that the Emperor should incline to it (so as to be secure on that side in making war against the common enemy) and he would, if the Emperor wished, mediate (mesleroit) therein. Answered and caused to be answered by Granvelle as follows (succinctly, because they desired to despatch quickly to their master, and the Emperor was the more willing to satisfy them therein because of what follows touching the King's men of war here), viz :1. Showed great pleasure at Briant's coming, and at learning news of the King by a person of such trust. 2. Supposed that the king of France would do his best to traverse affairs of Scotland, but, in any case, the Emperor would not fail in his obligations to the treaty and to friendship. 3. 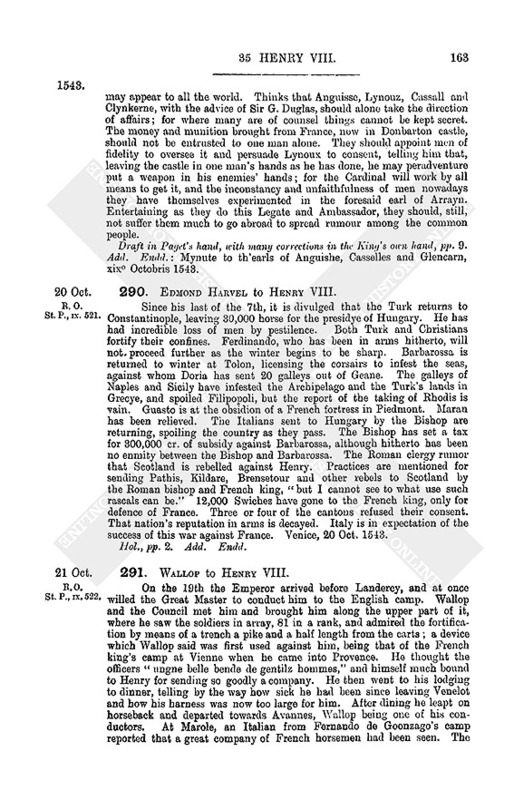 That resolution could not yet be taken for next year, but rather depended on the result of the siege of Landreschies, and whether the common enemy would succour it or give battle, as he boasted, and also upon other public affairs, especially the Turk's designs in Hungary and France (where his army by sea is still at Tholon) and the Imperial Diet. To their instant desire to know whether he would be personally at the Diet, answered that that depended on the above and upon his health, but he thought that his being there would much benefit affairs. 4. That, upon Chapuys's writing, letters were made to the Sieur de Beures, admiral, and into Holland, and the Admiral had reported that he sent six ships, two of which were wrecked and the others damaged (as Briant said that he saw) and that six other of the Emperor's ships had joined those of England; but, in all events, a re-charge had been made. 5. Declared the inexcusable wrong done him by the duke of Holstein, who allied himself with France and assisted both France and Cleves against him, and insolently defied his countries here, and that he had indeed heard that, seeing how the Emperor proceeded against Cleves, Holstein repented and wished to treat, but he would not listen until he heard the conditions and probability of it. Instance had already been made to him on Holstein's behalf and, meanwhile, it was not expedient that the King should mediate (mesla), which might make the Duke more insolent. Thanked the King for his good will therein. The Ambassadors seem satisfied with these answers, as they think their master will be also. The general, Mr. Walop, wrote yesterday to the Emperor that the four months of aid accorded by the treaty, and for which they were sent, would shortly expire and their treasurer* had no charge to pay them longer; and therefore, if the Emperor desired them to serve longer, as they would willingly do, he should provide for their entertainment. 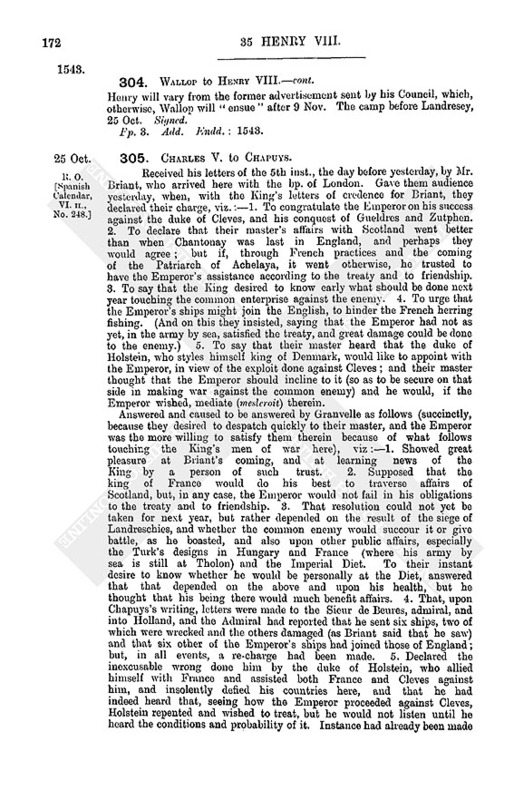 Upon this, reminded the ambassadors of Chantonay's charge and the King's honorable answer touching his said men of war, by which the Emperor had firmly believed that although they remained longer than the four months the King would pay them, since the enterprise was against the common enemy. The capture of Landreschies was at hand and the French king boasting that he would give battle, and approaching with his son the Dauphin, and the Emperor could not believe that their master wished to withdraw his men in such a conjuncture, but rather, if they were in England would send them for such an action, by which both he and they might acquire great honor. 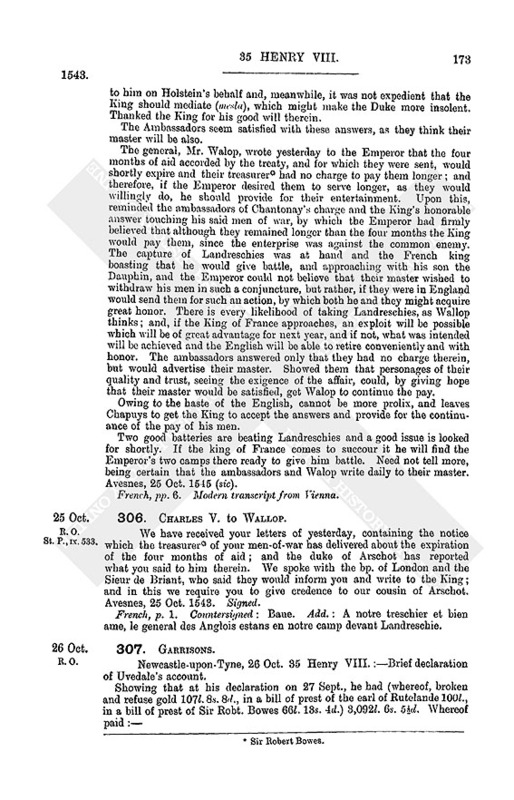 There is every likelihood of taking Landreschies, as Wallop thinks; and, if the King of France approaches, an exploit will be possible which will be of great advantage for next year, and if not, what was intended will be achieved and the English will be able to retire conveniently and with honor. The ambassadors answered only that they had no charge therein, but would advertise their master. Showed them that personages of their quality and trust, seeing the exigence of the affair, could, by giving hope that their master would be satisfied, get Walop to continue the pay. Owing to the haste of the English, cannot be more prolix, and leaves Chapuys to get the King to accept the answers and provide for the continuance of the pay of his men. Two good batteries are beating Landreschies and a good issue is looked for shortly. If the king of France comes to succour it he will find the Emperor's two camps there ready to give him battle. Need not tell more, being certain that the ambassadors and Walop write daily to their master. Avesnes, 25 Oct. 1545 (sic). French, pp. 6. Modern transcript from Vienna. R. O. St. P., IX. 533. 306. Charles V. to Wallop. We have received your letters of yesterday, containing the notice which the treasurer (fn. 10) of your men-of-war has delivered about the expiration of the four months of aid; and the duke of Arschot has reported what you said to him therein. We spoke with the bp. of London and the Sieur de Briant, who said they would inform you and write to the King; and in this we require you to give credence to our cousin of Arschot. Avesnes, 25 Oct. 1543. Signed. French, p. 1. Countersigned : Baue. Add. : A notre treschier et bien ame, le general des Anglois estans en notre camp devant Landreschie.